Men, no longer of draft age, were required to register at their local draft board, just in case the U.S. needed them for their occupation, etc. This included men who were born between 28 Apr 1887 and 16 Feb 1897. "I affirm that I have verified above answers and that they are true." the back side of the above form, contains information the registrant's physical appearance and is signed by the Registrar. The location of the local board is given along with the date of registration. 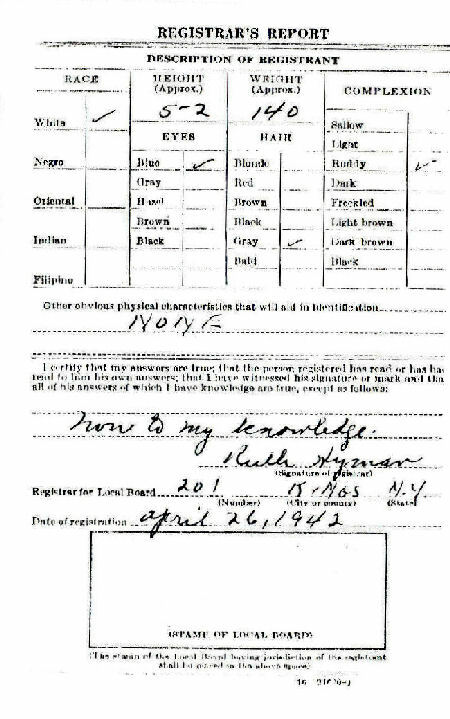 As in the World War II draft registration card, the Registrar certifies that "my answers are true; that the person registered has read or had had read to him his own answers; that I have witnessed his signature or mark and that all of his answers of which I have knowledge are true, except as follows: 'None to my knowledge." The registrant is White, 5 foot, 2 inches, 140 pounds, with a ruddy complexion, with no "other obvious physical characteristics that will aid in identification." 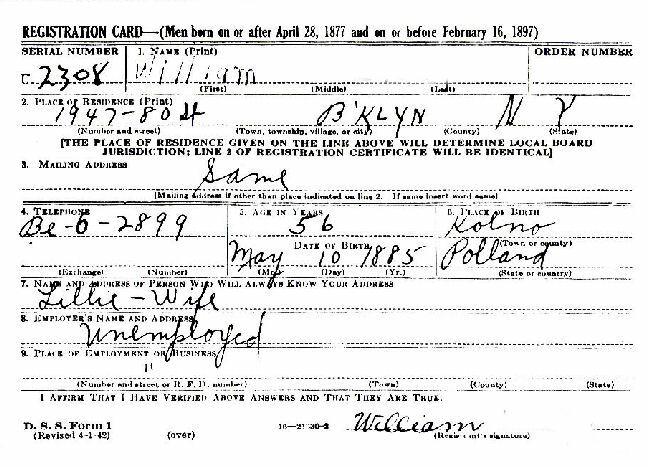 One can search the databases at Ancestry.com (pay-for use) for World War II draft registration cards. Here you can learn about those who registered. Click here for an example of just some of the information you may learn. This was just some of the information retrieved when simply the word "Pultusk" (for the town of Pultusk, Russia/Poland) was searched with nothing else.